Accra, March 25, GNA - The Ghana Boxing Authority (GBA) has fired back at Ben "Congo Soldier" Ankrah for accusing the body of handpicking Raymond Narh and Abdullai Amidu to contest for the International Boxing Federation (IBF) Intercontinental Lightweight title. Mr Moses Foh-Amoaning, Acting Chairman of the GBA told the GNA Sports in an interview that Ankrah is simply not abreast with time, adding that they did not handpick the two boxers. He said Kermah Boxing Promotions made the contact at the offices of the IBF and got to know about the vacant title. The Acting Chairman said Amidu is under the management of Kermah and at the same time the African Boxing Union (ABU) Champion, whilst Narh is the National Lightweight Champion, hence the decision for selecting them was right. He said Ankrah's assertions in the media is a great misconduct since he has no business in talking to the media, adding that the boxer should have contacted the GBA for explanation before going public. Mr Foh-Amoaning said, "It is high time boxers use the right channel in voicing out their grievances through their managers, promoters and trainers, but not to go directly to the media". 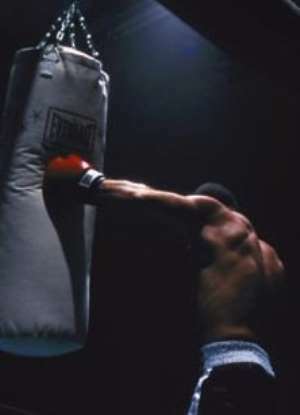 "The allegations are baseless and the challenge of the boxer does not hold any water," the GBA acting chairman stated. Mr Foh-Amoaning noted that the GBA is yet to finalise it arrangements on the fight and this will be done after the promoters have paid the sanctioning fee. He announced that the said fight would now be between "Congo Soldier" and Amidu since Narh is out of the country. The GBA Acting Chairman said "Congo Soldier's" noise has come to nothing because he would now have the opportunity to fight Amidu and prove himself. He said "Congo Soldier" will however face the Disciplinary Committee of the GBA for his conduct because he has breached the ethics of the profession and the rules and regulations of the Authority. It would be recalled that "Congo Soldier" early this week expressed his dissatisfaction with the selection of Narh and Amidu for the IBF Intercontinental Lightweight Championship. Amidu became the ABU champion when he "Congo Soldier" retired in a championship fight last year.